In a large stockpot, cook the ground turkey, onions and garlic in the 1 Tbsp of olive oil until the turkey is done and the onions are soft. Add the chilis and spices to the meat mixture. Cook for 5 minutes. Add 2 cans of cannellini beans and the chicken broth to the pan. 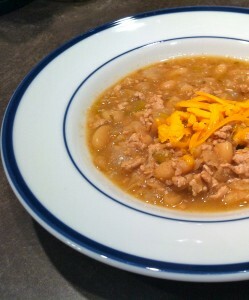 Squish the 3rd can of cannellini beans into a paste and add to the pot to thicken the chili. Season with salt and pepper. Serve with grated cheese and hot sauce to taste. Recipe Notes: I liked this chili but Dewey thought it was “meh”. It isn’t very spicy so definitely kick up the cayenne if you like it hot.